Shoppers form an impression of every retail store when they enter them. Does it make them feel too short because they could not possibly reach the top shelf? It is due to a multitude of factors. There is a relationship between store size, ceiling height, aisle width, and fixture height. Combined with store type and product assortment, they all affect customer experience and expectation. Of these relationships, display fixture height is the most easily determined. So let’s talk about the optimal size fixture you need, and how to determine the fixture height. Ceiling height should not determine shelving height, and the axiom of the ‘higher the fixture the better’ is no longer valid. Typical retail ceiling height starts at twelve feet and up. The larger the space, the higher the ceiling can be. Smaller spaces of 1500 to 5000 square feet may have shelving no higher than 60”-66”. Up to 25000 square feet, fixture height can reach eight feet, with ceilings of 14 feet or more. And big box type stores have taller fixtures of 14’H or more with 20’+ ceilings. 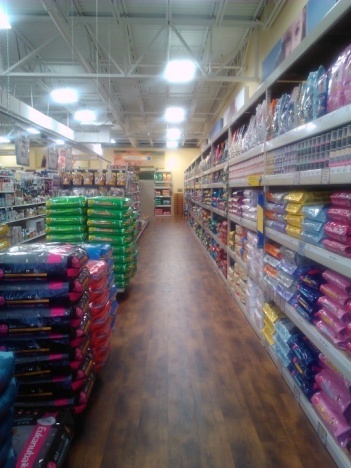 Taller fixtures need wider aisles, requiring more floor space. The important thing to remember is the distance between the top of your shelving and the height of the light fixtures. This is the comfort zone felt by your customers. Higher ceiling lights and wider aisles can accommodate higher fixtures. Prevent a confining feeling by providing adequate space above and around your retail display shelving. Shelving size is predicated on your product assortment and inventory levels. There is no rule requiring the same size fixture be used for every row of shelving. Plus, you must decide what look and feel you want your customers to experience. Large product size or large quantities of product will require larger shelving, with deep shelves, to display them.Conversely, small product size and quantity may fit better on smaller and shorter fixtures. By varying shelving heights in different parts of the store you can convey a different feeling and product focus for each one. 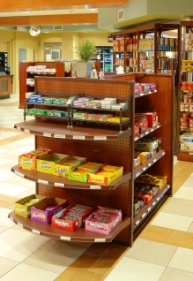 Match your products to different types of display shelving. 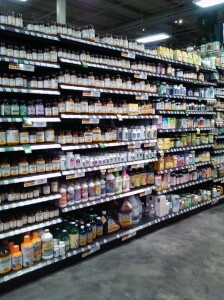 Example: Tall shelving conveys volume, broad product selection, depth of product, or discount prices. Shorter shelving conveys lower volume, select high quality products, and a more intimate shopping experience. By blending fixture size and height your customer will perceive broad product selections in one area, and specialty product selections in another. Each area or department establishes its own identity based on the product assortment, fixture type, and height within the space. The basic answer to “how high is too high?” for shelving depends on your analysis of the factors we have touched on (and we have only discussed the very basics). Working with an experienced merchandising and shelving expert can help with your decisions. Purchasing new store fixtures provides your best opportunity to get the right size for your space, to properly display product assortments, and deliver a great customer experience. For more information about shelving size and height options for better merchandising, contact Midwest Retail Services today. Call 800-576-7577, or email us at info@mw-rs.com. One of our shelving experts will be available to help you! This entry was posted in Selecting Your Display Fixtures and tagged Display Fixtures and Shelving, Gondola Shelving, Retail Store Shelving, Shopping Experience, Store Shelving, Tips I Can Use by Midwest Retail Services. Bookmark the permalink.